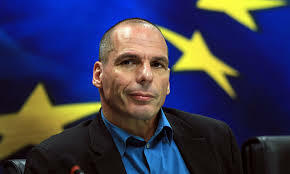 The new Marxist Greek finance minister Yanis Varoufakis has warned Germany to respect his nation’s sovereignty as proposed bailout reforms go in front of the parliament in Berlin. In this respect, he is absolutely correct. But this is the problem of the faulty design for the Euro from day-one. To create a single currency that had to consolidate all debts as Alexander Hamilton did at the birth of the USA. Thereafter, whatever debts a state incurred would not have impacted the Euro or the EU as a whole. They simply refuse to properly structure the Euro and therein lies its demise. The Euro Crisis will never end for there is no intent to ever pay off debt by any nation anyhow. Who are these people fooling besides themselves?